Finally the day came as waiting for Equestria girls, today is your graduation ceremony, the 3 are very nervous and do not know to look for this special day. Let's give a hand to choose the best hair color that emphasizes trendy hairstyles that they usually use. You can also choose the ideal for girls to look radiant outfit, select flashy accessories that enhance your look. Do not forget that you can choose the cap and gown to match the choice of clothing end. You girls all shine like a star. 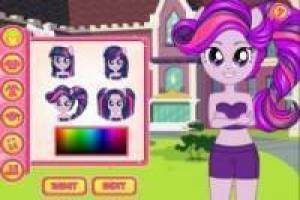 Enjoy the game Equestria graduation, it's free, it's one of our dress games we've selected.